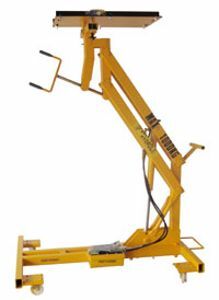 This versatile piece of heavy duty steel constructed equipment is invaluable in a workshop. Its 1000kg capacity can be used for removing large truck transmissions, four wheel drive transmissions, front wheel drive power trains, differentials and fuel tanks. Secure the load with the tough ratchet drive nylon strap. The unit is powered with an air-driven hydraulic pump that will run from shop air at 80 to 120 psi. The lowering valve and a check valve are incorporated in the lift cylinder. This means that the load is locked in the event of a hose failure. The lowering valve is a needle that will enable precise lowering from 2,050mm to 850mm. The jack is fitted with 150mm diameter roller bearing wheels for easy manoeuvring and positioning.